You know how some teams play “over their heads” and win more games than they should? You know how scrubby players sometimes get off to really hot starts in April, only to fall apart once the “sample size” increases? Here’s what I’m getting at . . . I also got to catch up with my buddy Devin Trone and re-meet a ballhawk named Eli. Here I am with them. Rob (like Devin) is an old-school ballhawk in that he only tries to catch home runs. 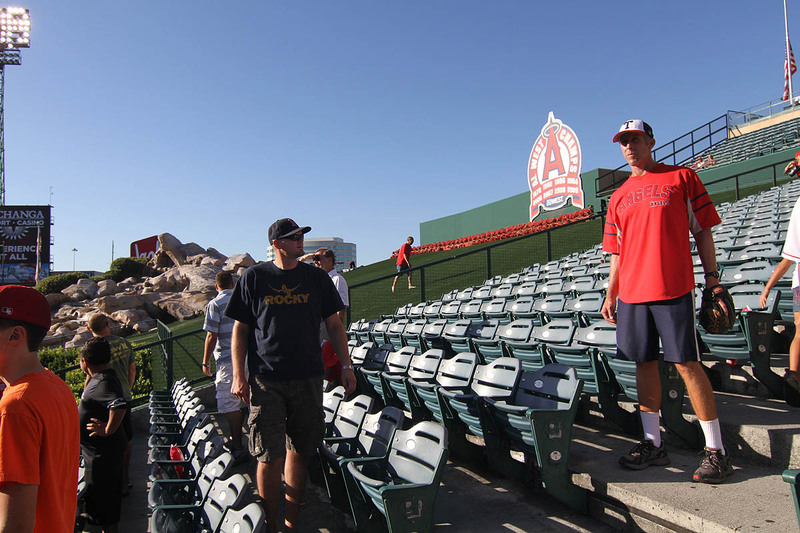 He hangs out in straight-away right field and usually wears shirts with cut-off sleeves, so he’s easy to spot. 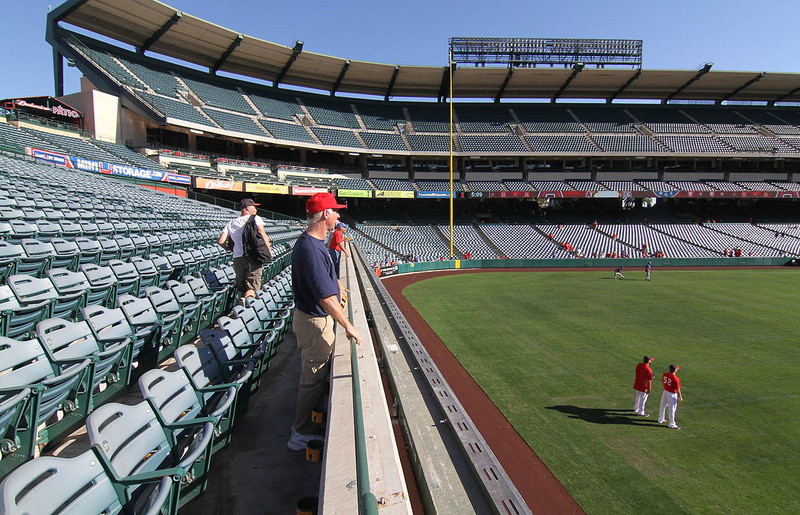 Next time you’re at Angel Stadium, go say hi to him, but give the man his space. 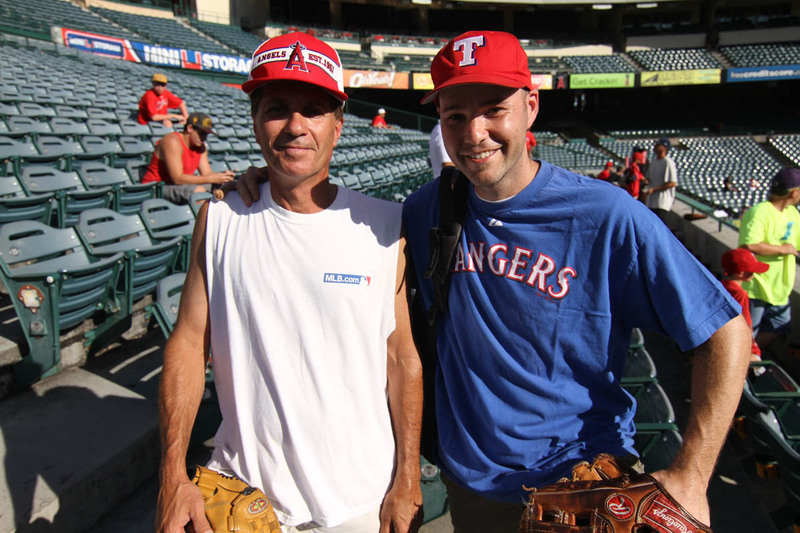 As you may have noticed, I was wearing Rangers gear in the photo above, but it barely helped. Here’s a photo of me in the front row, being ignored . . .
See him in the background, trudging up the green hill? 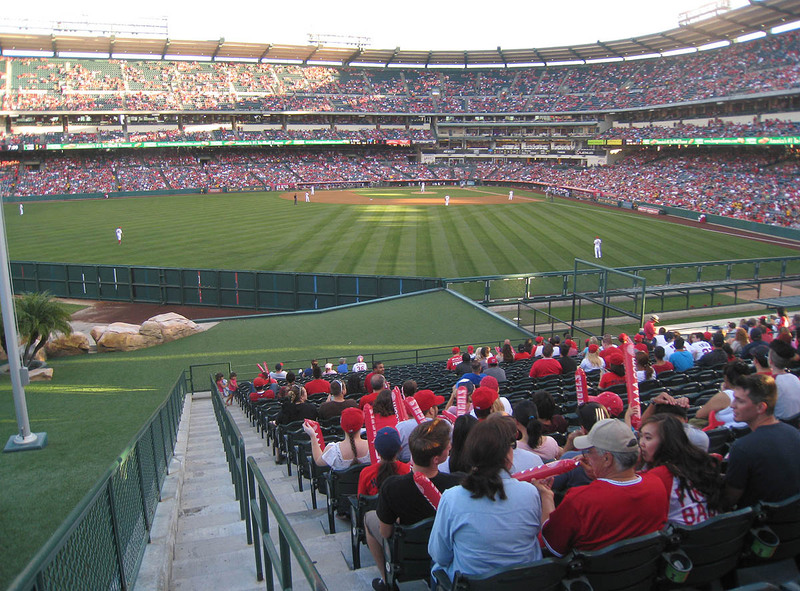 At the Rangers’ ballpark in Arlington, fans are allowed to run out onto a similar hill for baseballs, but here in Los Angeles of Anaheim, where the guards are way more strict than they need to be, it’s prohibited. Security didn’t chase him out there. 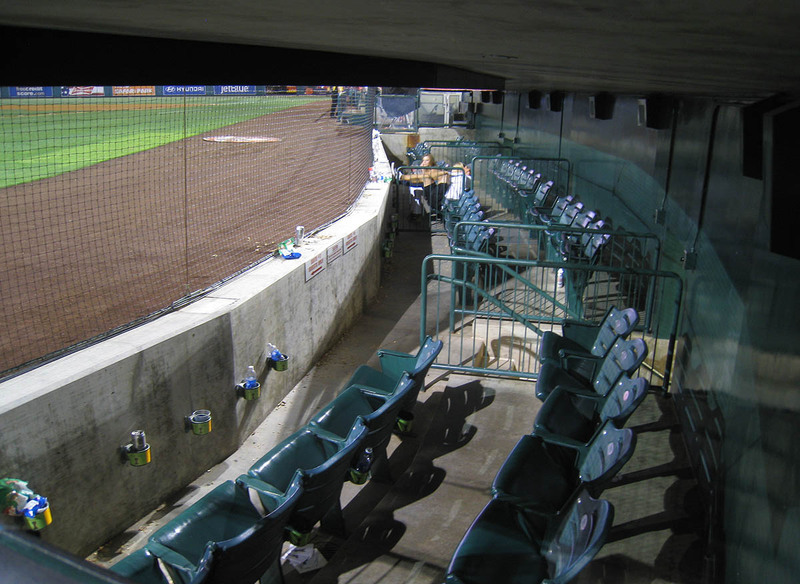 They waited calmly for him to return to his seat, and then they removed him from the section. 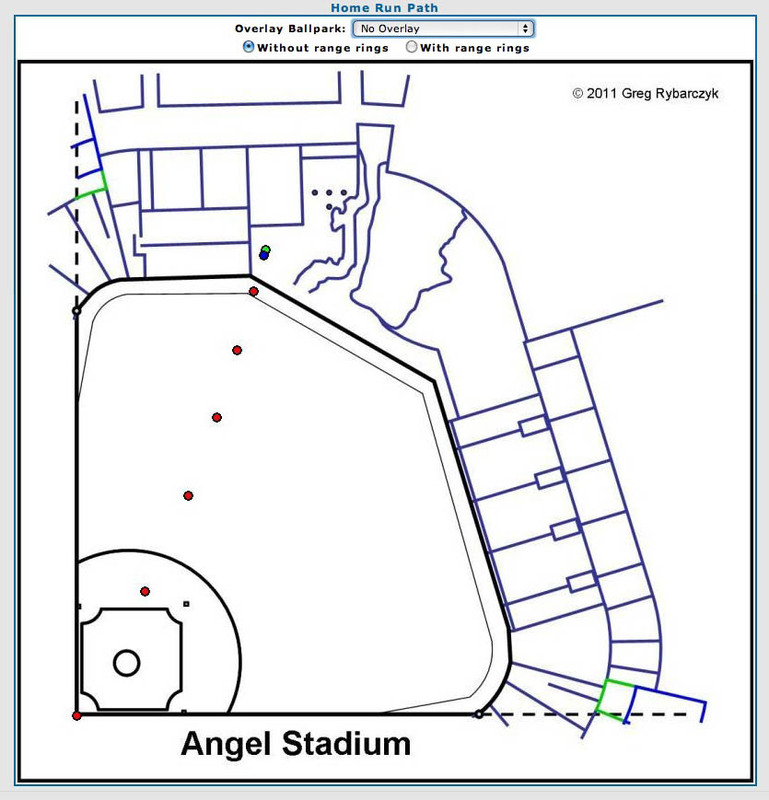 They might’ve kicked him out of the stadium and, for all I know, arrested him for trespassing. I’m not sure how it played out. 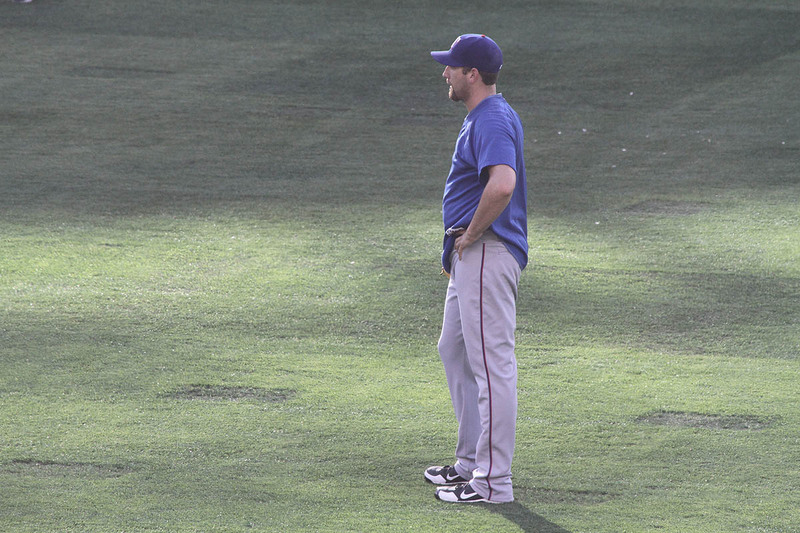 At the time, I had no idea who he was, so my friend Brandon (who was with me for BP only) took that photo of him. My plan was to post it on Twitter and hope that someone would be able to identify him. 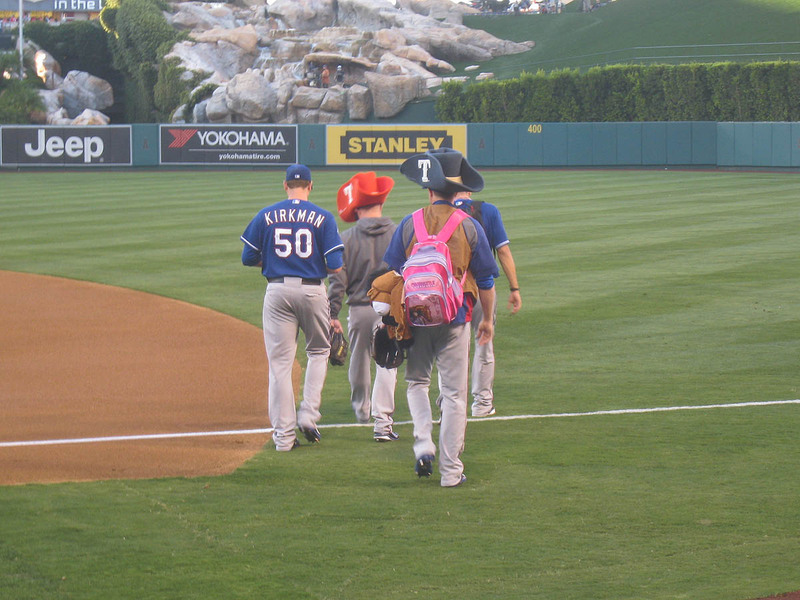 Soon after, several Rangers relievers headed out toward left field . . .
Let me clarify something: when I said that the ball was traveling “too far,” I didn’t mean that it was going to sail completely over my head. I meant that it was heading for the middle of the platform and was therefore likely to bounce over my head. 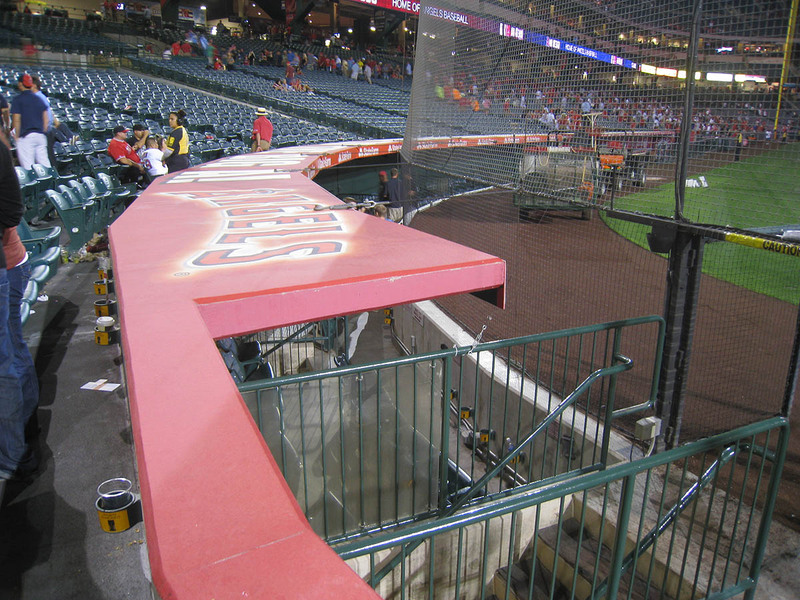 During BP, I’d noticed that home run balls were bouncing high off the platform, so in order to have a chance now, I needed the ball to barely clear the wall — but Andrus’ shot was clearly going deeper than that. 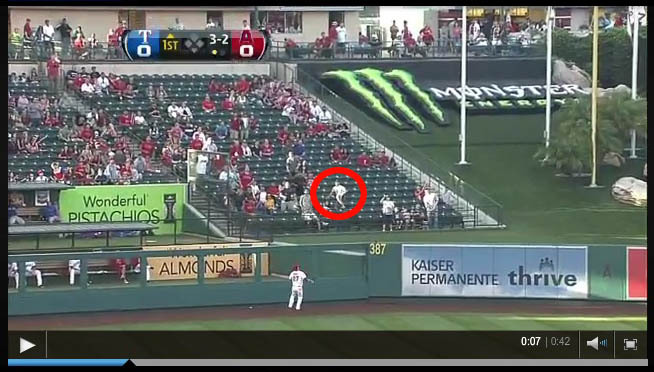 Here’s a screen shot of the ball landing . . . 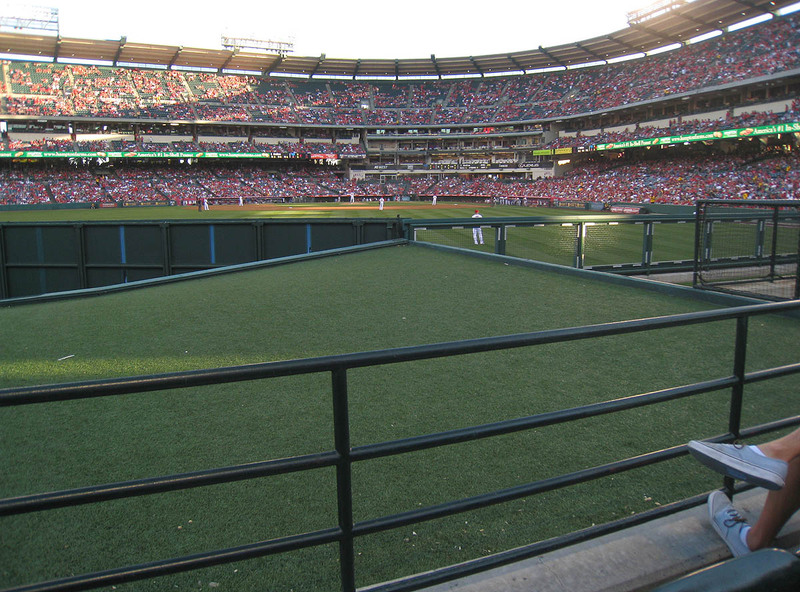 The stupid ball bounced FIVE FEET over my outstretched hand and plopped into the lap of an unsuspecting fan several rows behind me. Can you believe that crap?! The ball HAD landed deep on the platform. GAH!!!!!!! I’d done everything right and gotten screwed at the end by bad luck. 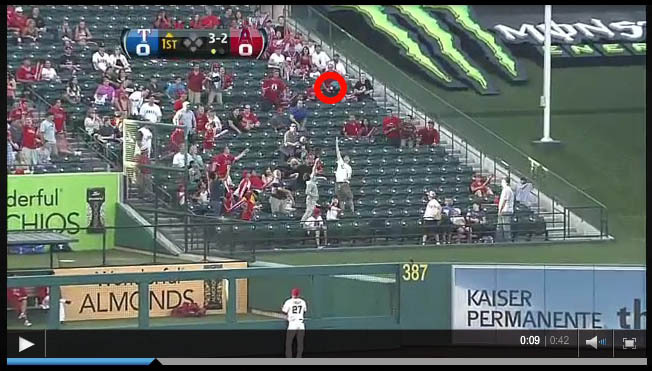 Here’s the actual video of the home run on MLB.com. It seemed to be my best shot at getting a post-game ball. 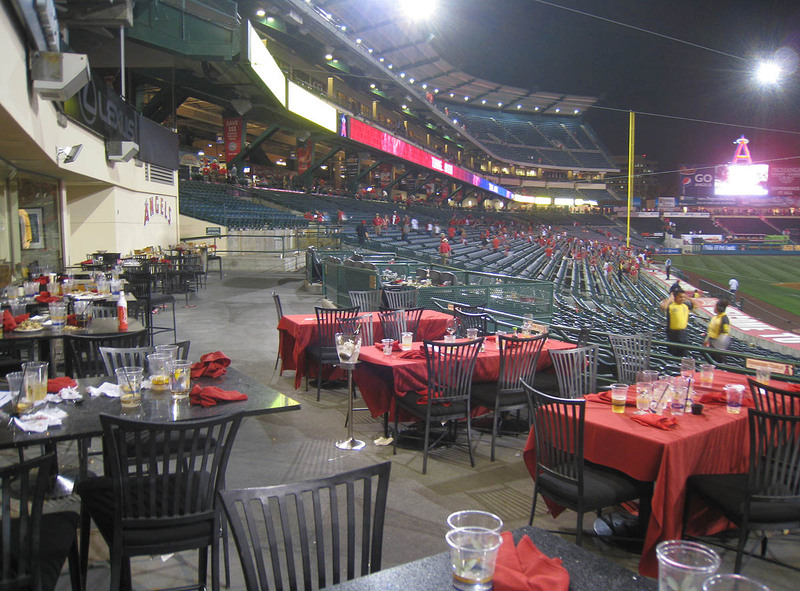 The Angels were winning, so I wanted to avoid the chaos behind their dugout, and the umpires were going to be inaccessible. 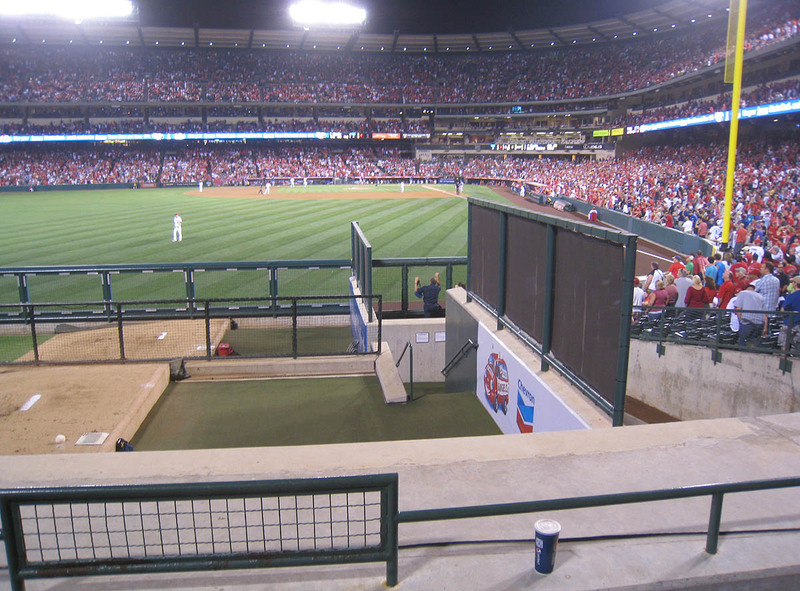 They exit the field directly behind home plate, and without a Diamond Club ticket, there’s no way to get there, so I played the bullpen . . . and it worked! 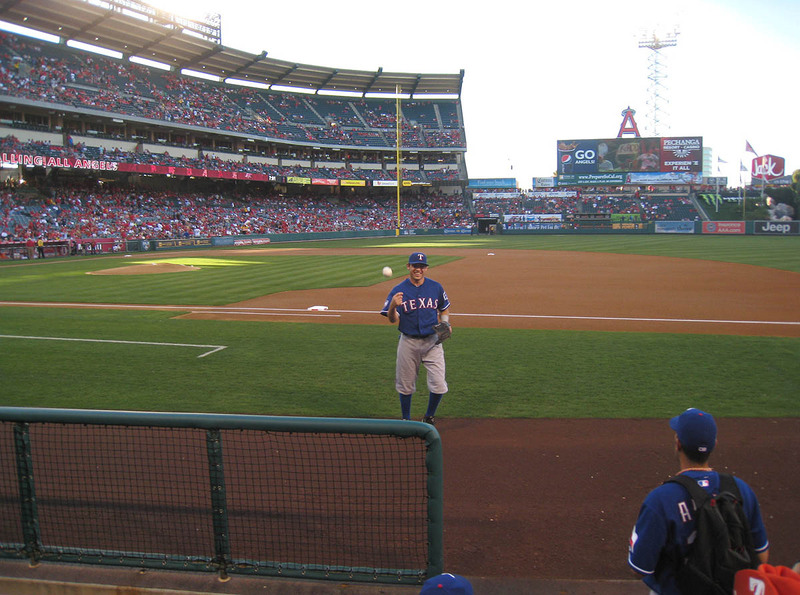 After the final out of the Angels’ 6-1 victory, I made eye contact with Alexi Ogando and got him to toss me a ball. My day ended with four lousy toss-ups — not a total disaster, but from a ballhawking perspective, this was probably my most frustrating game of the season. I did, however, enjoy a brief post-game adventure. 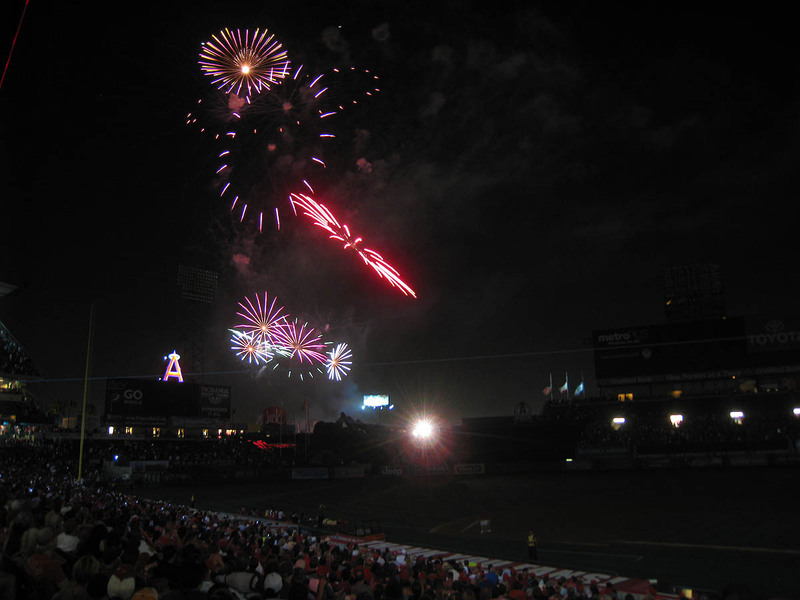 During the finale of the fireworks show . 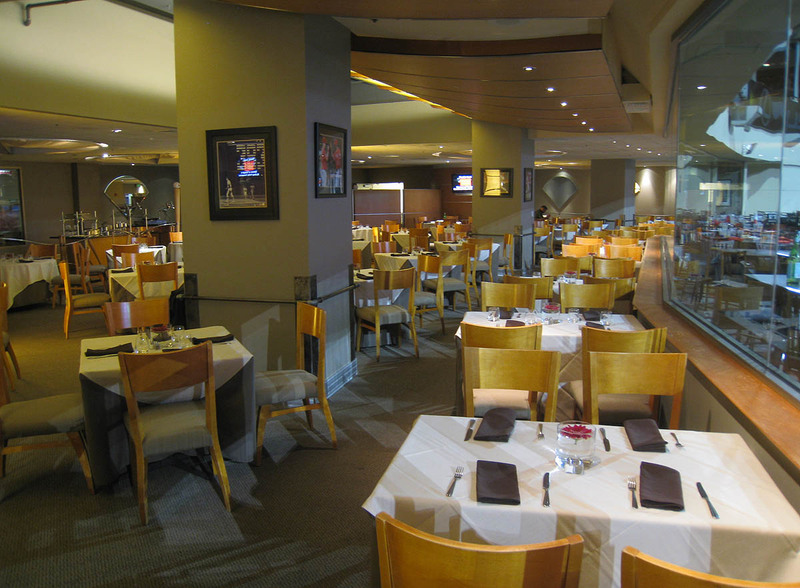 . .
Here’s what the indoor dining area looks like . . .
That’s all I got. Several yellow-shirted security guards were milling about, and I wasn’t feeling particularly conversational. • 316 balls in 40 games this season = 7.9 balls per game. 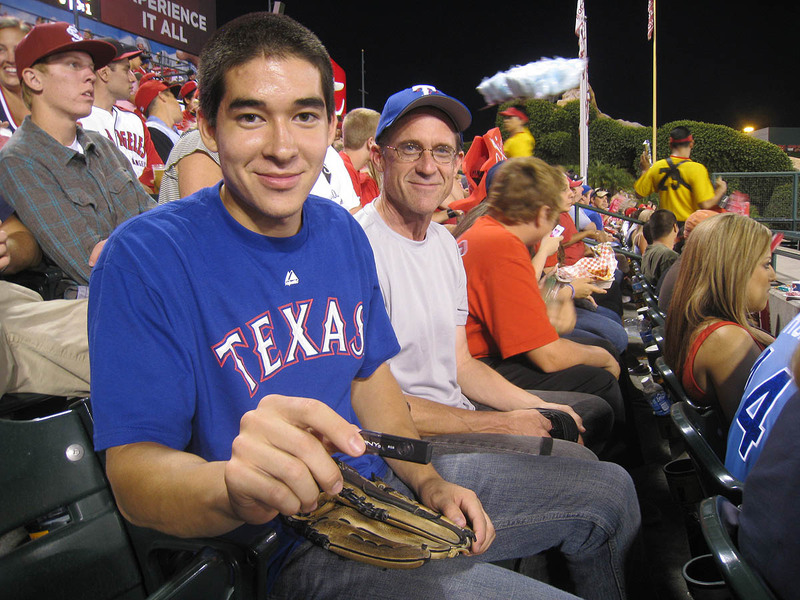 Now, about that mystery Rangers player who tossed me a ball . . . 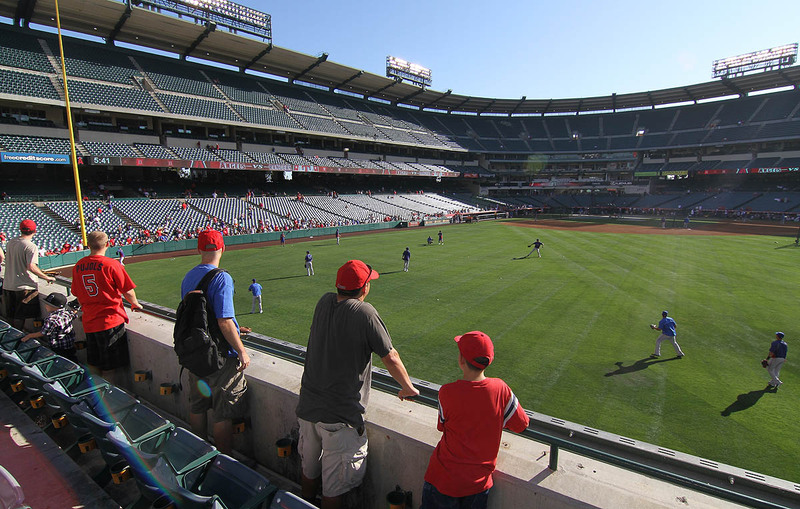 Although my day in Anaheim ended on a positive note, I couldn’t wait to get the hell out of there and head back to PETCO Park for one final game. Do you think Pete Rose should be in the HOF why or why not? Awesome to finally meet you Zack. I’m actually more of an autograph guy now too. 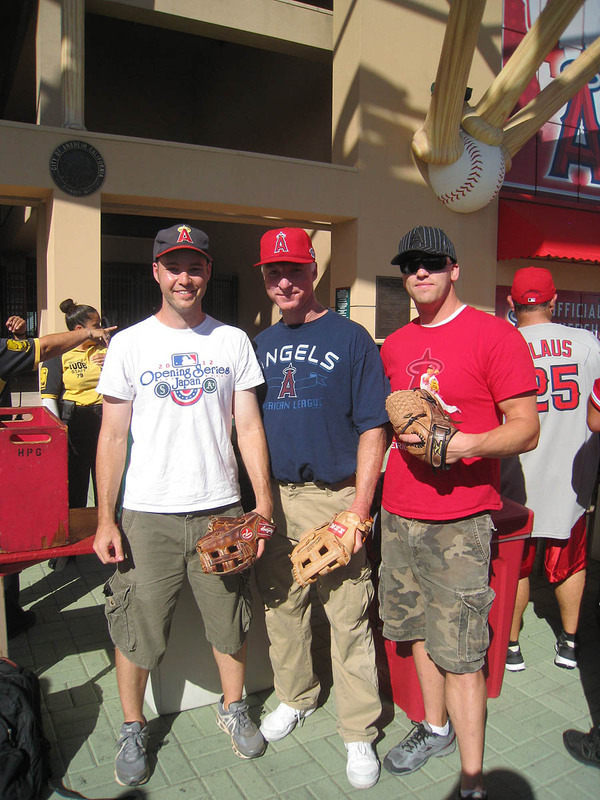 Ryan and I decided we needed to be ballhawks again that day in honor of you visiting. We weren’t very successful. I snagged 2 and I think Ryan left empty handed. Hopefully you’ll be back out here again next season. Yes because there are other guys in the Hall who’ve done bad things.
. . . and Dylan! Unlikely. Yankee Stadium is crazy-crowded this time of year. I might make an appearance there this weekend. Depends on the ticket situation and the weather. Well, hey. I didn’t know that you switched over to autographs. Where were you guys during BP? Sorry I didn’t put on a better show for you, but sometimes, like I said, everything seems to go wrong. Sounds good. I’ll be there Saturday, maybe I’ll see you there. That’s actually the one day that I know I won’t be there. My uncle’s 80th birthday celebration is taking place in Garrison, NY, so I’ll be there with lots of family. 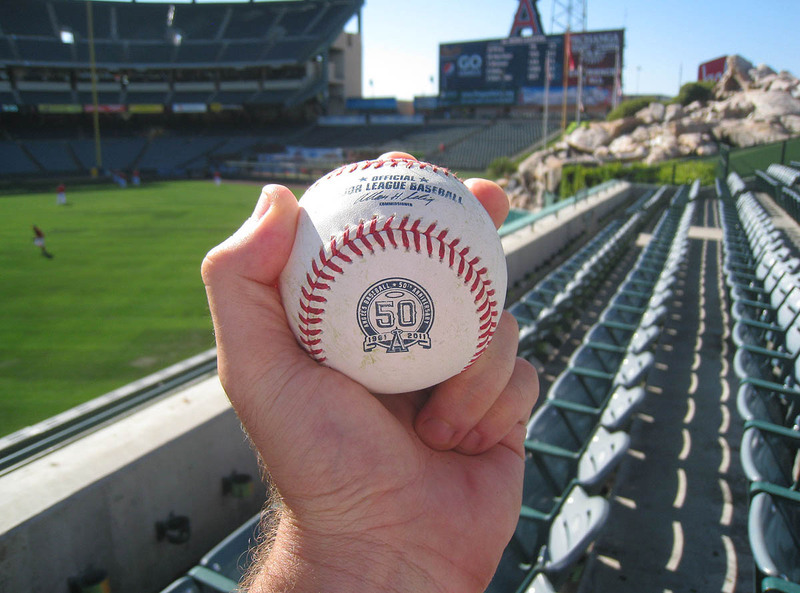 looks like the angels are still stocked up on commemoratives. The club looks nice. Hopefully the Mets will still have a bunch next year. I’ve hardly seen any during BP this season. Two things. First, it is great to see a cameo by Warren. 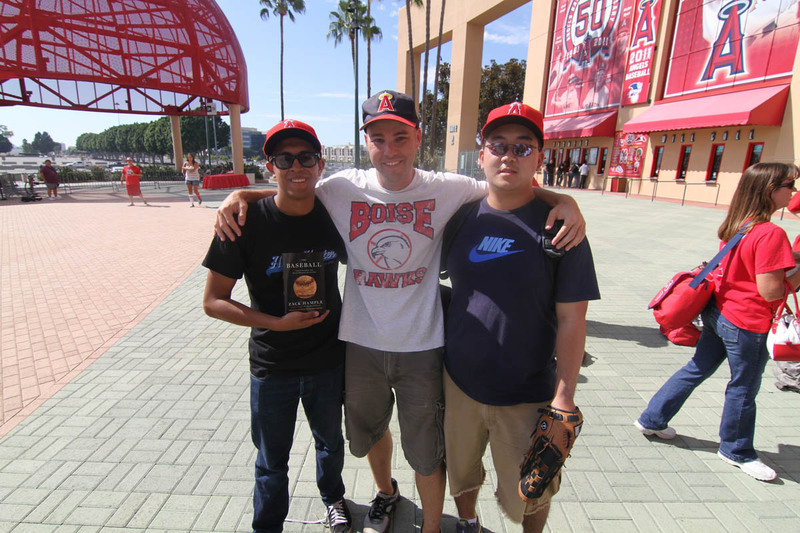 We met Warren when we were in Anaheim in 2010 and, to welcome us to his stadium, he gave Tim a Ken Griffey, Jr. BP homer that he’d recently caught. It was an awesome and unexpected gift that currently sits proudly on display in Tim’s room and will continue to do so for years to come. Second, I’ve been thinking this for a while and I figured I might as well put it out there: I am officially against the use of “ballhawk” as a verb (or the related term “ballhawking”). Ballhawk the noun? Whatever. But as a verb, no thank you! 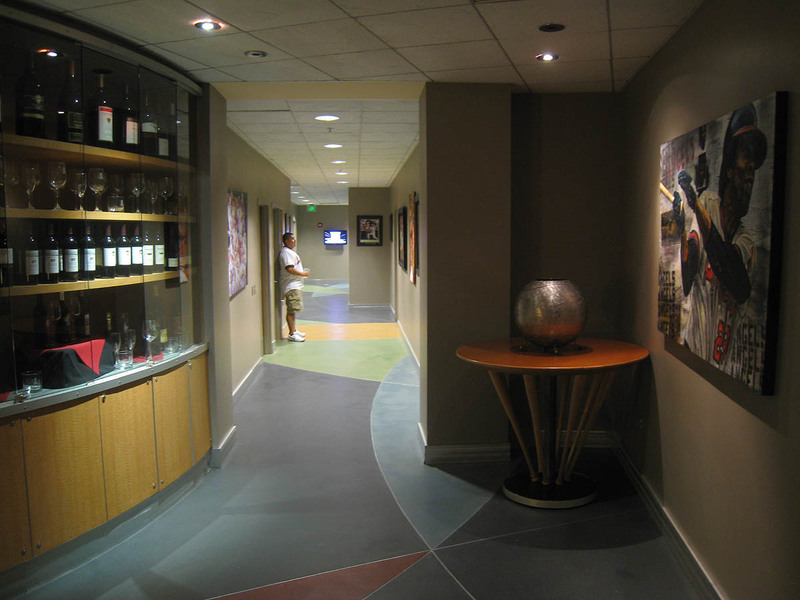 I tend to only ballhawk between setting myself up for different autographs or if I need a fresh ball to use for the series as a team ball for players to sign. We were out in Left Field trying to hawk. 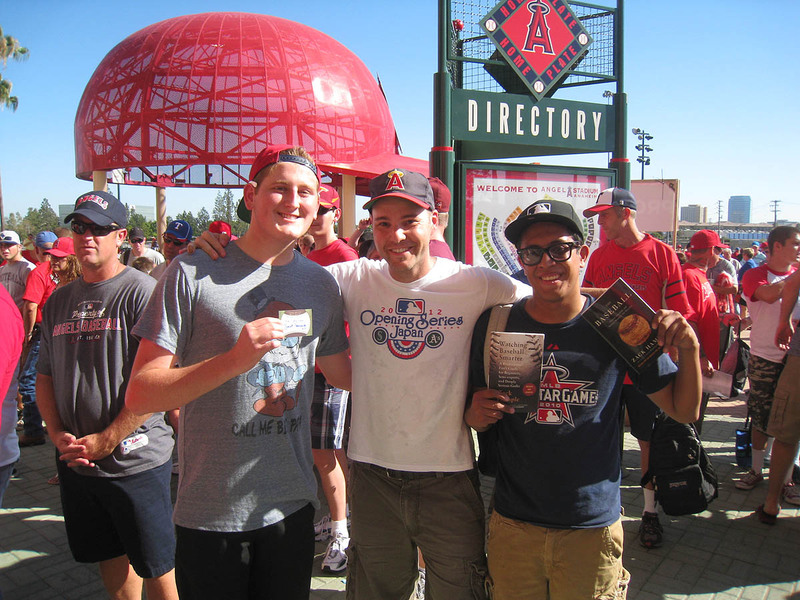 Warren had more luck than me in the ball department, but I had a grapher home run scoring Hamilton on a ball I brought. Always nice seeing you in the stadium Zack. We were watching from the Left Field wall and saw Jordan Walden throwing toss up’s and hoped he had been a little generous toward you. Thats interesting….did you only see that one commemorative ball, or were they all over the place? 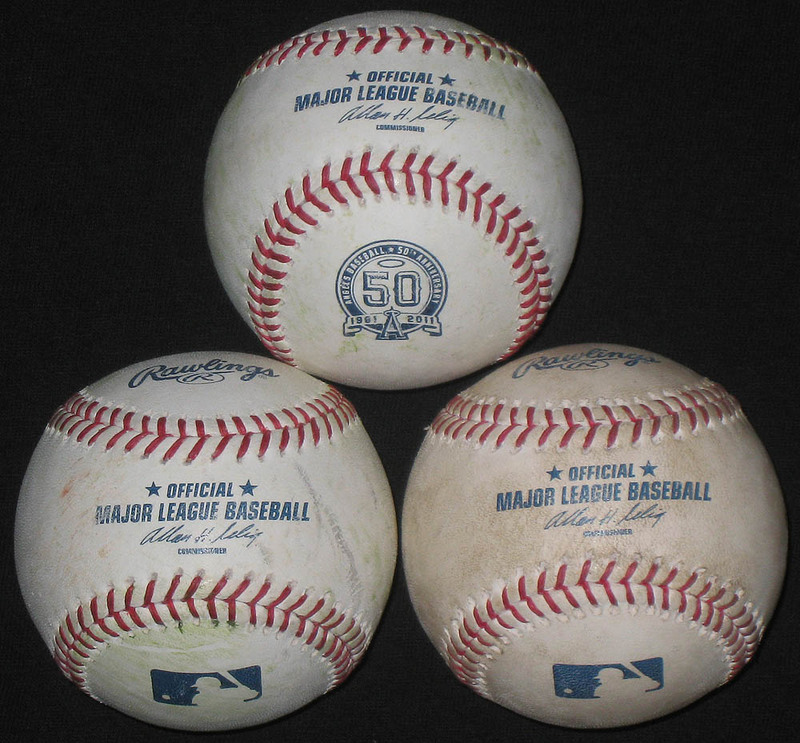 I never knew teams had this many leftover commemorative balls. Very very cool about the Griffey ball. Warren’s a good dude. As for “ballhawk” as a verb, did I use it like that? Or did someone else.? Ahh, gotcha, but no . . . no love from Walden. Hope to see you guys again soon. Maybe next near? Who know, it could happen. I do spell check, but in this case, I must’ve made a couple edits afterward, and as you noticed, I screwed up on one of them. How dumb. 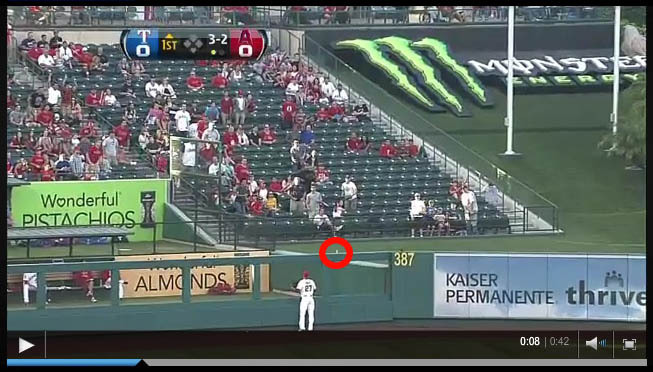 Did you really throw your glove up in the air? Yes. I’m not proud of it. I see players do it all the time in BP. Maybe it’s an east coast thing.